Outside the Green Zone thar are lots of Dragons! When I worked at the No-Name Software company, one of my coworkers really truly believed that the city limits were only downtown and that anywhere else had to be the suburbs. He honestly believed once you left the Loop, you were no longer in "The City". Many of my friends who grew up in the suburbs and other transplants who have relocated to Chicago also believe that the city is really comprised of only a few select neighborhoods near downtown and the lakefront -- River North, Streeterville, the Gold Coast, Lincoln Park, Lakeview, Bucktown, Wicker Park, Lincoln Square, Ravenswood and North Center - to name a few. 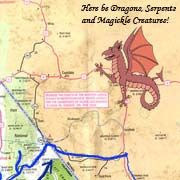 They believe that if you went West of Western Avenue, a dragon will swallow you up whole and spit out your bones. At Crib Chatter, a blog I spend way too much time at, they have a name for this area: The Green Zone (GZ). Green Zone: A sliver of relatively safe and gentrified areas within the City of Chicago proper (read Urban) where housing stock is most desirable based on specific key criteria such as proximity to the Lakefront, access to rapid transit, and other amenities without the inconveniences of gangs or lower income denizens. There is some debate whether school system impact whether a neighborhood is considered part of the Green Zone. My definition of the green zone changed significantly when I started factoring schools into the equation. There are plenty of neighborhoods that I would consider living in from a safety, cultural, nightlife perspective that have mediocre to awful schools. For someone looking for a long term city home for their family and that isn't in the actual 1%, those places really aren't in the picture. It really narrows your search considerably. streets and no rusted out cars just sitting around. Technically that would be Norwood Park, or Edison Park, or even Belmont Heights. Those areas didn't see the growth other areas did during the boom and have maintained their value during the bust. Greenzone is just a humorous way to say that the neighborhod has been signigicantly genetrified and offers the amenities that most yuppies are looking for in an urban neighborhood. Yes, the term is a dig that those hoods outside of the greenzone aren't safe. We all know that it is a generalization and there are plenty of urban neighborhoods that are safe but aren't really considered alternative neighborhoods for the typical resident who wants to live in the greenzone. Many of the non-greenzone hoods may be more blue collar than white collar. May be less densely populated. May not have the same amenities. Different strokes for different folks. The choice to live in the Greenzone has nothing to do with race and everything to do with class and having access to certain amenities that members of a particular socio economic class value. The reality is that every major city has their own Greenzones. I don't care what anyone says, no one is rushing to move to Englewood.